Your lip prints are like chapters of a book, each one telling more about your story. So accurate are Jilly’s readings, that many of her clients hire her time and time again. They’re also requesting the need for more lip print readers, even worldwide, but Jilly can’t be everywhere. To help with these requests, she has trained Certified Lipsolgists. They are wonderfully gifted entertainers, who provide you with the same, uncannily “right on” interpretations as Jilly! 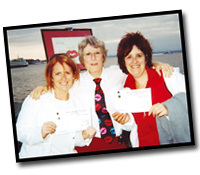 Jilly’s client base is so vast and diverse—whether you’re a CEO, a couple celebrating an anniversary, or an excited bride-to-be, you’ll love Lipsology. Contact Jilly today to add YOUR event to the list!